While driving through the beautiful country sides of Italy, I was impressed by the diversity of crops and the tenacity of the farmers to plant in every nook and cranny. It reminds me of Iowa, where you drive for hours and virtually every square of land is cultivated. The grape vines and olive trees roll with the hills in Italy! As we drove from one end of the country to the other, we would read about the various cities, history and agriculture. But the beautiful thing is Italy is relatively small, (slightly larger than the state of Arizona), so its bounty is available everywhere. It has always been my habit to peruse supermarkets when I travel, whether I am in Spain or Boulder. There are so many specialties, and I want a chance to at least see them all! My most impressive supermarket experience came in Cernobbio, sitting on the gorgeous Lake Como. From our room at the Regina Olga, we could see the lake and the boardwalk that takes you to the water taxi. As we were getting ready one morning there was an enormous amount of people walking the boardwalk with shopping bags, many of them older women. We couldn't tell where they were going or coming from. When we walked to the water taxi, we were greeted by an entire supermarket outside. Every vendor had a specialty, and they had specialty trucks that opened on the sides and set up shop. I learned that this traveling grocery spends 6 days a week traveling to different lake towns to sell their wares. The first truck I encountered was the meat truck. The glass window ran the length of the truck, and was filled with everything from steak, ground meat, chickens, pork chops, veal, lamb and every other cut of fresh meat you can imagine. Clean and on ice, when they sold out, it was gone. Behind the counter were enormous rotisseries with a hundred or so chickens cooking. We all know how intoxicating that smell is! The butchers were all in white aprons and haggling with the customers. Maybe you were in the mood for fresh fish? The next truck was stocked with fresh seafood. Dozens of different whole fish, shrimp, squid, octopus, urchins even fresh water fish from Lake Como. There was even a section of seafood already cooked. It appeared to be breaded and perhaps fried or baked, but convenience food has a place in all cultures. But I press on, because I am amazed every time I approach the next truck. No table would be complete without fresh flowers, even on a brisk fall morning. 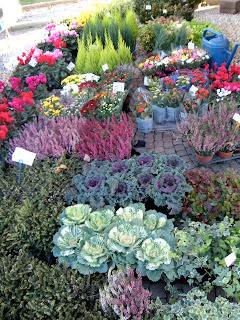 The selection was staggering, and they had pansies, ornamental cabbages, mums and more varieties for planting. There were numerous bins with fresh stems for making your own arrangements and the selection would rival any florist. And we move on, to the cheese and salami truck. How the Italians love their cheese. Wheels and bricks, blue and white and yellow, hard and crumbly and soft and creamy. I wanted to taste them all. I love the pungent aroma of cheese. Did I mention the Buffalo Mozzarella? Contrary to the name it isn't made with buffalo milk as we know buffalo. But milk from domestic water buffalo. The cheese was in balls in vats of water and cured in jars with olive oil and red pepper. I love the melt from a fresh mozzarella. And the salami. I remember the long salamis we would have in our house when I was a kid, and I laugh when I see the skinny 5" rolls at the market now. But there they were, 24" long hanging in bunches. I can see my brother with his pocket knife right now slicing us pieces as kids, peeling the skin and tossing it to the dog. It was real salami skin, not plastic or wax that you see on that disgusting American invention, summer sausage. Yuk. And of course the prosciutto. Not one kind like you see here, but many different cuts, a variety of prices. 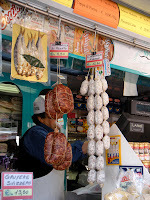 When we get to Parma I learn about the cuts and discover that Culatello is my favorite. And here is the produce. Zucchini flowers, fava beans, strawberries, baby artichokes, clementines, chestnuts, apples, bananas, figs it never ended. The most gorgeous I have seen. But only a basket of this and a basket of that. No huge overhead, no wilting lettuces. Pardon my photographic indulgence here, but I wanted to remember it all. And then the cured and pickled truck. Olives, huge bowls of olives. Jars filled with peppers, olives, tomatoes they were colorful and edible. There was a craze here for awhile of decorative bottles filled with these sorts of things that people bought for display! Why? These are meant to be eaten! Baskets of sun dried tomatoes, jars of marinara, whole nuts for eating. It was amazing. And yet there was more. There was a truck with nothing but dry foods. Cookies, crackers, boxes of mixes and candies. Another truck of bread. Homemade bread of every variety. Focaccia, ciabatta, baguettes, rolls, pizzettes, breadsticks. Every shape. And then a truck that sold, well, socks. Seriously, there were a few pair of shoes and slippers, but it was mainly socks. A truck of linens. Kitchen linens, bath towels, sheets and pillows. What a fun way to shop! I imagine it is a traveling grocery that makes it easy for the villagers to get what they need. Most people don't drive like we do, they walk for everything. It would be difficult to shop in a supermarket when you have this outdoor market every week. When we got to Parma, I could see the small shops that mimic all these trucks lining the blocks. You have your favorite market for everything and I am sure you become a regular customer quickly shopping like this. I like it. I think every foodie would like it. The Fresh Market and Dean and Deluca are the closest versions we have. But I doubt I will ever shop such selection surrounded by such beauty until I go back to Lake Como. So I have rehashed the European Adventure for my family mostly, hopefully others enjoyed it as well. But the highlight for a foodie like me was the food, (duh). Europeans have it all figured out, I would move to Parma in a heartbeat if I could, what a way of life! For obvious reasons I am skipping the Croatian and Bosnian food. It was good, don't get me wrong, but, it wasn't Italian! Every time we sat down to a meal, the waiter would bring our plates and I would say "Wait! I have to shoot a picture!" We also took along a stack of my sister Patti's wine labels from her vineyard. We slapped one on every bottle of wine we drank so it was sort of like she came along with us. This blog will be a little longer than usual, but it is necessary to get the food all in one! First a word about breakfast. I love Italian hotel breakfasts. Prosciutto, salami, fresh baked bread, Nutella, sometimes eggs, that fabulous coffee, and even a few Italian pastries. I could eat salami for breakfast every day! We begin in Venice where my parents and I met my sister Lori. Venice makes you think of Harry's Bar, Cipriani, gondolas...or Crazy Pizzeria, that's where we ate. We avoided the big cities, this was about Italy, not the touristy stuff, although we did partake in places. It was late when we got to our hotel outside Venice, a small Autostrada problem, navigation problem, call it what you want, we were lost. Crazy Pizzeria was rather large for an Italian restaurant, probably because we really weren't in a high tourist area and many locals were there, always a good sign. 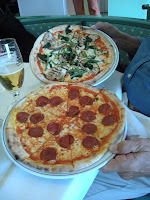 The menu was extensive with pizza and pasta. We ordered red wine, salad, pizza and pasta. The pasta was delicious. It was simple spaghetti tossed in olive oil, red pepper, and parsley. It was the perfect amount of heat. The pizza was the Crazy Pizza. Classic thin crust, sliced Italian sausage, hot banana peppers and black olives. It was the perfect first meal of the trip. When we left Venice the next day, we headed North to Lake Como, or Lago di Como. What a spectacular place. The playground for George Clooney, Madonna and Richard Branson. Honestly, it'd be a bit more fun to go there with their bank accounts. 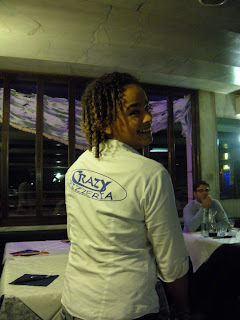 The outstanding meals were first in Cernobbio at the Hotel Miralago. It was a chilly fall afternoon when we arrived in Cernobbio and nothing but the bars were open, so naturally we drank. We walked around the small village, went to Villa d'Este, gorgeous but eerily empty, and killed a little time in our own hotel bar until 7:30 dinner. Leonardo our waiter at the bar was quick to offer us a little tray of olives, capers (huge capers from Sicily) and sun dried tomatoes. It was perfect to keep us satiated until dinner. Dinner was the perfect autumnal meal. The wine was delicious and the staff got a kick out of us putting our label on their bottle. For my entree I ordered chestnut pasta with bacon and pumpkin. Just thinking about it makes me swoon. It wasn't colorful, but it was earthy and delicious. The pasta was a dingy brown, but nutty and flavorful. Bacon of course is a bonus in any dish and the pumpkin was bright and fresh in a small dice. Lori had the pumpkin soup which was velvety smooth and delicious. We had to have the chestnut cake for dessert because it just seemed appropriate. Dessert in Italy is always a bit of a disappointment. Unnecessary if you will. The cake was great, but I would like it at 3 in the afternoon with a cappuccino! 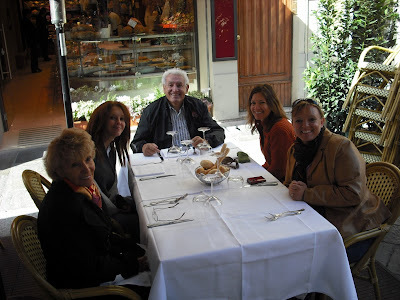 The next day we took the water taxi to Bellagio and shopped the narrow cobble stoned streets. We had a small lunch, pizza and salad, and a little wine at a small cafe called Carillon. The pizza was thin and delicious and the owner was all too happy to take me to the kitchen and meet the pizza guy throwing it to the ceiling and slowly stretching the round of dough. Of course a wood burning oven is why the crust cooked perfectly! We went back later for coffee and dessert and the owner took a wine label and posted it on his shelf with other memorabilia. Our last meal in Cernobbio was at Harry's Bar. Because it was off-season, the restaurants seemed to rotate their nights. Harry's was a disappointment, expensive, crowded and they did their very best to ignore us. The gnocchi I had wad light and delicious, but that was the highlight of the night. When we left the lovely lake area, we headed southeast toward Parma. Lori had a friend of a friend who had moved there to go to culinary school and sort of start over. We really had no idea if we would spend the day with her or grab lunch or what. It turned out to be one of my highlights of the trip. Parma is a smaller town and home to a University so there is a young population. It is also the home of Verdi and he is everywhere! We poked our head into a salumeria and were astounded by the wheels of Parmigiano-Reggiano and the many cuts of prosciutto and salami hanging. The next shop we poked around in was Pasticceria Torino. I felt transported to a wonderland of pastry. It was spectacular. The wood, the glass, the assortment of pastries. I bought a box of candied violets, and the flavor of them is impossible to describe. I bought them to put on truffles, but I don't think I could part with them, one little taste transports me back to that spectacular store. These little devils were a small shortbread disc with a cone of bittersweet chocolate mousse and a sprinkle of bittersweet chocolate. They were deathly rich and I was not inclined to share, sorry Lori. We also bought some shortbread type of cookies that we saved for a later date. They were good, but they weren't the chocolate bombs! We walked into Parma past the Duomo (easily the most spectacular church I have seen in Italy) and the city center. We ended up on a charming cobble stone street and ate al fresco with the large heaters cranked and taking off the fall chill. 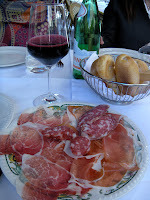 Antipasti of culatello (my hands-down favorite), stroghino, salami and coppa with fresh bread and local olive oil. Next, ravioli, 3 kinds, pumpkin, sweet herb and ricotta, and porcini. The pumpkin was my favorite! Next course was veal cheek with basalmic vinegar, (guanciale di vitello), with cippoline onions with tomato sauce, kind of sweet, and finally roast potatoes with rosemary. It was all delicious. We said no to dolce and walked around this charming town that was off at siesta, or whatever it is they do from 1:30 to 3p.m. every day. We stopped at a cafe for a quick shot of espresso and then to to Chocolat Milano, wow. The gelato was dark and rich and wonderful. We also bought chocolate bars because we weren't getting near enough oxidants from the red wine we consumed every day. And then sadly we left Parma. We decided Pesaro on the Adriatic was our stopping point that night but we had a quick detour into Maranello to order a Ferrari before we headed East. Just kidding, we watched 2 shiny red ones come off the line and although we tried to really take in the cars, we were taken with the very handsome Italian race car drivers who left Ferrari at 100mph. Vroom, you bet! We noshed in Pesaro because we were still digesting our Parma lunch. The next day we headed South into Puglia, we decided lunch would be with the locals at the Autogrill which I describe in the European Driving Adventure. No chicken fingers or burgers here. We arrive that evening in Faeto, the hometown of both paternal grandparents. Nestled in heart of Puglia, it is a small town clinging to a hillside. Our small hotel prepared a birthday dinner for my dad's 80th and the food was simple and rustic. It was the experience in Faeto that we will never forget. My favorite meal of the trip was the last full day in Italy, it deserves its own blog as I plan on recreating the experience for a few lucky friends. And I also have to devote a blog to the Cernobbio grocery that miraculously appeared one day on the plaza and disappeared with in hours. Hang on until then! Buon Appetito! 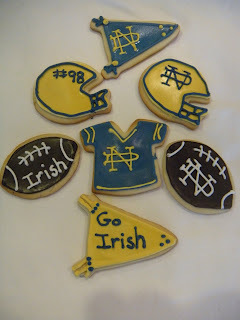 Okay, I have been a baking fool....having a blast doing it! Here is a rundown of the latest.